The Horizon Fitness EX-59-02 Elliptical Trainer is a fine piece of home gym equipment that delivers high level workouts on a comfortable and sturdy chassis. With a special patented platform that allows the most natural stride and smooth motion, the EX-59-02 feels much like a higher quality piece of commercial equipment. Priced at just $629 on popular ecommerce sites like Amazon.com, this elliptical trainer is great for people on a budget who cannot afford higher priced models that are over $1000. Do not be fooled by the low, value-priced model, it still comes with many of the features that you would expect to find on luxury home gym equipment. Read this unbiased Horizon EX-59-02 Elliptical review, and find out if this is the unit to bring home. One of the key characteristics of the 59-02 model is that it delivers the smoothest and most natural feeling stride by using Horizon’s patented Six Star Certified platform. This platform has been researched thoroughly and uses the ideal placement of pedals and handlebars to reduce stress on the hips and back. It also has one of the more natural elliptical paths in the market, with an 18-inch stride that minimizes fatigue and operates on a smooth and large drive pulley. 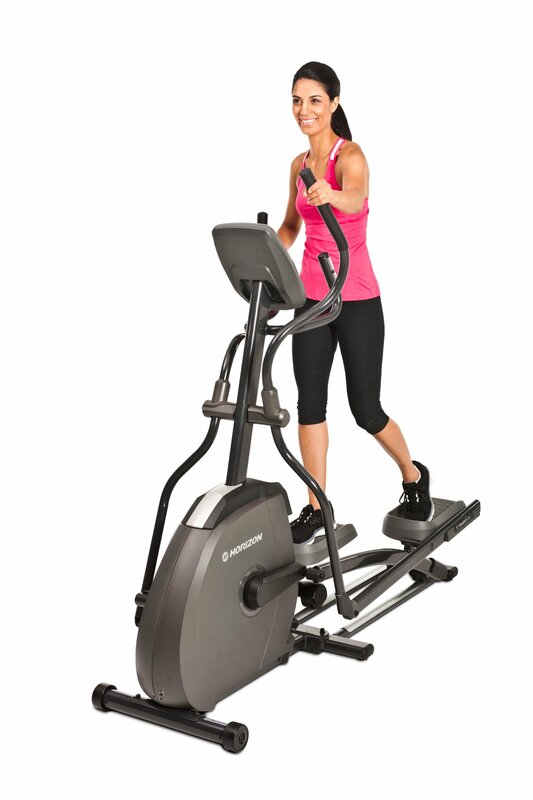 If comfort while you workout is a priority of yours, do not overlook this elliptical trainer. While this Horizon Elliptical undeniably mimics walking and running motions to deliver the most effective workout, that is not the only feature that you may be looking for as a consumer. In addition to this, the EX-59-02 by Horizon Fitness offers users 10 different workout programs to choose from so that everyone is equipped with the tools that they need to achieve their fitness goals. Programs include: Weight loss, Weight Loss Plus, Constant watts, Reverse Training, Random, Calories, Intervals, and a Manual setting if you have your own regime you would like to follow. If entertainment is a concern of yours, you will stay entertained as you burn up a sweat on the high-quality platform. The unit features an extremely advanced Sonic Surround Sound system for when you can enjoy your music out loud, and an MP3 console with a headphones output so that you can enjoy music in privacy when there are others in the room. Never get bored getting your cardio again when you have a dependable elliptical that is capable of playing your personalized media. For its price, this elliptical trainer offers consumers looking for home elliptical trainers a great value. Much like the higher prices EX-69-02, this model offers a comfortable platform with workout programs and entertainment features. While it is lacking an incline feature, for its price the Horizon EX-59-02 is a comfortable and technological unit that will deliver an effective workout. With one of the best warranties in the industry and a sturdy and solid design, this elliptical continues to get a lot of positive attention from users.